I’m a big fan of ice cold water. It’s refreshing and invigorating and thirst quenching. I found a pretty useful life hack online a few months ago that allows me to have ice cold water whenever I want it. All you have to do is take a used bottle of water, fill it half way, lay it sideways in the freezer, and leave it alone for a few hours. 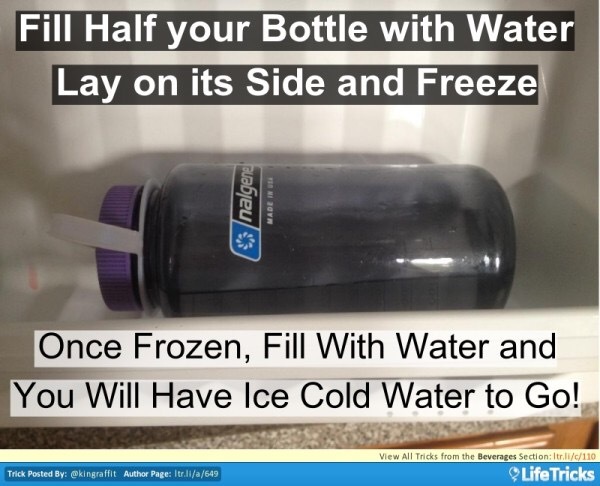 Once the water is frozen, you open the bottle and fill it up the rest of the way. If you do it right, there will be ice on one side and water on the other. The ice makes the water cold instantly and keeps it chilled for hours. No muss, no fuss. I keep a half frozen bottle of water in the freezer at all times. It’s a cheap and easy way to impress thirsty guests when they come over. They think I’m smart and clever for coming up with it. I don’t tell them that I stole the idea from the internet. It’s not lying. It’s deceiving. There’s a difference.